What is the Arno Shield? 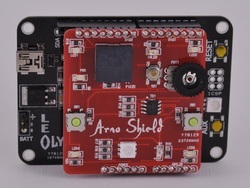 It's a follow up to the Arno board for those that prefer to work with a shield. 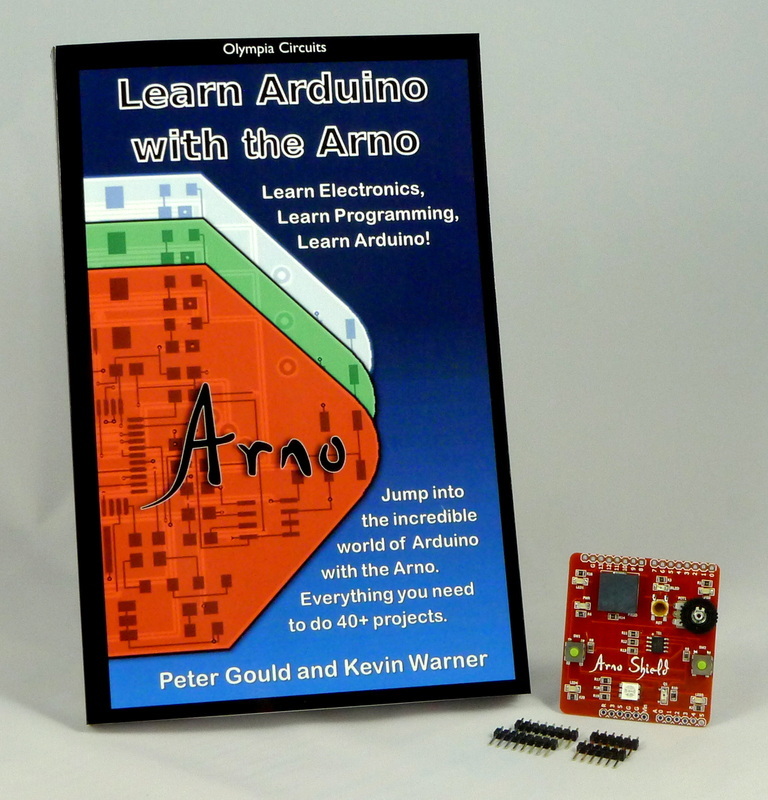 When you've completed all the projects that are in the included book, you can pop the shield off your Arduino compatible board and start building your project. It's also a great way to test out your project ideas without setting up a breadboard. Sometimes you just need an LED or two and a button to interact with your sketch. Plug in the Arno Shield and you're ready to go. 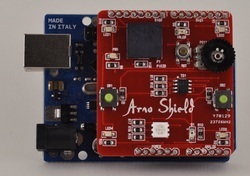 The Arno Shield can be used for all the same sketches that are included in "Learn Arduino with the Arno"
The Arno Shield comes with "Learn Arduino with the Arno"
The book that accompanies the Arno Shield as part of the Arno Shield Kit is much more than an instruction manual for connecting a board. We've grown to expect hardware without a good reference on how to use it. You can spend hours searching the internet for simple answers. This isn't a way to start your journey into Arduino. 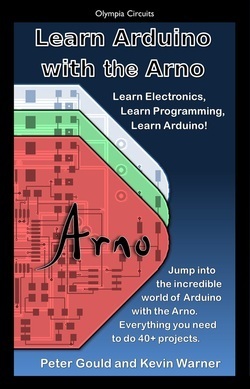 We know you'll have a great time with Arduino if you get over the learning "hump". This book gives intros into electronics and programming, then it explains how to program and understand over 40 sketches. You'll start with things like blinking and fading an LED. Then advance through more interesting ways to program outputs. There are sketches that take advantage of the USB capabilities of the Arno. And lots of sound, you'll have blast with the piezo as an output (and input).